Can I confess something? I bought everything to make sushi, um, three or four years ago, and it all sat in my cupboard because I never dared actually make it. For some reason it was more intimidating than tackling a multi-step fancy cake or taking three days to make croissants from scratch. I think I sometimes erroneously assume that certain foods are going to be extraordinarily hard to make at home. Sushi is one of those things. What if I make it incorrectly? What if it falls apart? Valid concerns, sure. But a little irrational, too. Fast forward a few years, and I’m braver in the kitchen. 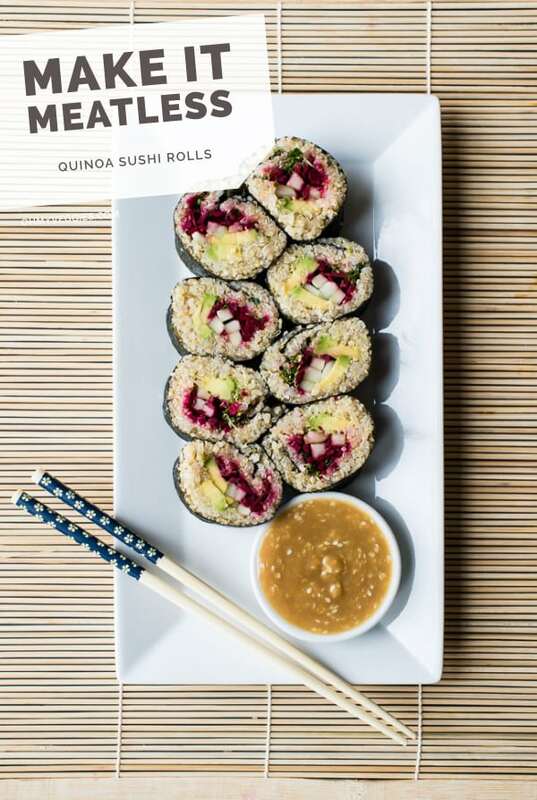 I was ready to tackle not just sushi rolls, but quinoa sushi rolls. Swapping out quinoa for sushi rice added another level of trepidation, but I have seen loads of recipes on other blogs and websites, and I’ve even seen them in the refrigerated section at my favorite stores. It was time to conquer them at home. Spoiler: it’s pretty much the same as using rice. I worried that the quinoa would not stick together, but it totally did! The quinoa is cooked with a little less water than normal, then the sushi-su (seasoned rice vinegar) is added and the hot quinoa absorbs the extra liquid. It’s a beautiful thing. (And I dare you to not eat all that quinoa as you’re waiting for it to cool to room temperature.) The hardest part was narrowing down which fillings I wanted to use. Nori, the thin “paper” made from seaweed, is an integral part of any sushi roll, quinoa or otherwise. It’s so thin and seems so fragile, but it’s remarkably pliable. (So don’t be like me and wait for four years to finally get around to using it!) For these quinoa sushi rolls, I used my favorite combo of fillings — sliced avocado, shredded raw beets, broccoli sprouts and julienned cucumber. I love the way they play off each other. Creamy, crunchy, earthy, and slightly pungent—in a good way. Assembling the sushi rolls, as I’ve said, is so much easier than you think it will be! Lay a piece of plastic wrap on top of the bamboo mat and be sure to leave enough of a border around the edge of the nori so that it will seal nicely. That’s key so the rolls don’t fall apart when you pick them up. The filling goes neatly into the center. Then you pick up the edge of the sushi mat, which aids immensely in the rolling process. If you don’t have a bamboo mat, they are super inexpensive and you can find them at practically any Asian market or kitchen store, and even some grocery stores. They only cost a few dollars and do make rolling much easier. Cut the rolls into 6-8 pieces with a very sharp knife. (Amateur tip: cut these while they are still wrapped in plastic because it helps them stay together.) And all that’s left to do is stir together the sauce and start noshing! Quinoa is on a roll! Irresistible (and easy!) sushi rolls made with hearty seasoned quinoa instead of rice, then packed with fresh veggies and served with an addicting dipping sauce. Inspired by Almonds and Avocados’ Quinoa Sushi. Add the quinoa and water to a medium saucepan set over high heat. Bring to a boil, then lower the heat and cover. Simmer until the quinoa is mostly cooked through but still on the undercooked side, 15-20 minutes. The water will have absorbed but the quinoa won’t quite be translucent. Meanwhile, set a small saucepan over medium heat and add the rice vinegar, honey and salt. Bring just to a simmer and keep warm until the quinoa is ready. Pour the vinegar mixture into the pan with the quinoa, stir well, cover and let sit until the quinoa absorbs the liquid. Remove the quinoa from the heat and let it cool completely. While the quinoa cools, mix together the Miso-Sesame Dipping Sauce. Combine the sauce ingredients in a small bowl. Taste and add additional honey if desired. Refrigerate until ready to serve. To assemble the sushi rolls, lay the bamboo mat on a flat surface and spread a piece of plastic wrap over the top. Lay one sheet of Nori on top of the plastic wrap. Spread 1/3 of the quinoa on top of the Nori, leaving a slight border at the edges. In the center of the quinoa, arrange 1/3 of the filling ingredients starting with the avocado, followed by cucumber, then the beets, and ending with the sprouts or microgreens. To roll, start with the end closest to you. Using the bamboo mat for help, bring the end up and tightly roll over the filling, pressing as you go. Press the edges together to seal. If edges are not sealing well, dip your fingers in a bowl of water and gently wet the edges of the Nori, then try again. With a very sharp knife, cut the sushi into 6-8 slices. Serve with the dipping sauce. Leftovers keep refrigerated in an airtight container for up to 2 days. Lindsey Rose Johnson is a food stylist + photographer based in Boise, Idaho. She is a reformed picky eater and lover of whole foods. Lindsey blogs at CafeJohnsonia.com where she shares healthy gluten-free recipes. This is so cool looking. I’ve never thought about using quinoa to make sushi! How good is that?! I love quinoa because it is so versatile. Thanks for sharing & happy Wednesday! Love the idea of using quinoa in place of rice!! Looks super delish! Quinoa? I didn’t even think of that. This looks totally doable and as someone not eating rice right now- eatable! haha! I loved hearing your sushi story. I did the same thing-bought all the ingredients and never used them! Sushi seemed way out of my comfort zone, even though way more complicated things didn’t scare me. I finally dusted off the nori, rice, and wasabi powder. Loved it! This quinoa version sounds fantastic. Sushi is definitely overly intimidating for as easy as it actually is! I’ve only ever made it with millet and sushi rice, quinoa is definitely next on my list! This was perfect! Gave you a little shout out on my blog 🙂 Thanks!